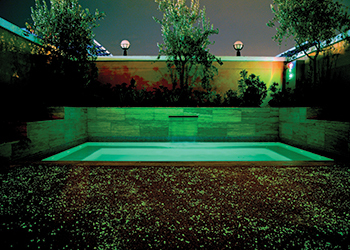 The Evaglow paving system ... zero energy consumption. Making Ground, a specialist in high quality and environment-friendly landscape solutions, has witnessed an increase in demand for its sustainable paving solutions after being named winner of the eighth Gaia Awards in the ‘Marble, Stone and Ceramic Category’ at The Big 5 show in Dubai, UAE, last year. The Evaglow paving system was shortlisted out of a total of 283 companies for the prestigious Gaia award, which recognises an exceptional product that has been successfully integrated into the built environment in the Middle East and North Africa (Mena) region, according to Ryan Evans, operations manager at Making Ground. 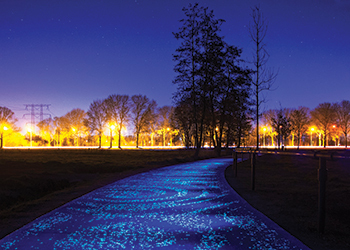 Evans describes Evaglow as a unique and sustainable paving system that glows in the dark, creating a decorative and eco-friendly way of illuminating patios, pathways and general paving areas. It doesn’t require any cables or electricity and is described as the perfect solution to help prevent wastage of energy and money for lighting. “No energy use means no carbon emissions, light pollution into the sky reduced, the need for streetlighting is reduced too, making Evaglow a truly sustainable material that decreases energy use,” he says. Evaglow is based on Making Ground’s Evabound resin-bound paving system, which is combined with special glow stones that absorb light during the day and emit a soft glow in the dark. This decorative feature provides an excellent solution where light pollution is a concern and can eliminate the need for electricity to power streetlighting. Evaglow absorbs daylight and glows in the dark. Evaglow offers all the benefits of the Evabound system in that it is hard-wearing, permeable, slip/skid-resistant, uses locally sourced stones and is hailed as the region’s very own sustainable paving. The system was originally designed for stormwater control and is said to be compliant with the UK’s regulations on sustainable urban drainage systems (SUDS). “In hot climates and places of drought, SUDS is extremely important. The clever open structure of Evabound/Evaglow systems is SUDS-compliant and allows water to drain through to help eliminate water pooling. A permeable sub-base helps rain and irrigation water to soak back into the ground, rather than creating surface run-off, which stormwater drainage systems may struggle to cope with. Whilst originally designed for stormwater control in the UK, permeable pavements are now also emerging as a potential cool pavement/hardscape,” says Evans. “The open structure allows air, water, and water vapour into the voids, reducing the heat island effect. Making Ground products are considered to be the GCC region’s own sustainable resin-bound paving systems as both Evabound and Evaglow use local aggregates. “The system offers sustainable paving with far more benefits and design flexibility than traditional paving methods. In addition, it is a non-hazardous, fast-curing, flexible, solvent-free resin which encapsulates decorative stones. The end result is a smooth, seamless, permeable, anti-slip surface with an attractive natural or coloured stone finish,” says Evans. Making Ground was officially launched in the UAE in 2013 to make sustainable flooring systems using locally sourced materials. These sustainable systems include the paving range – Evabound – and the artificial grass range – Evagrass. The company’s resins have been manufactured in the UK since 1986. Making Ground, which is considered as one of the UK’s largest polyurethane manufacturers, specialises in the development and manufacture of polyurethane products. In the UAE, the company has supplied to projects such as The Palm Jumeirah and Jumeirah Village Triangle in Dubai, and Saadiyat Island and Yas Links Golf Course in Abu Dhabi.